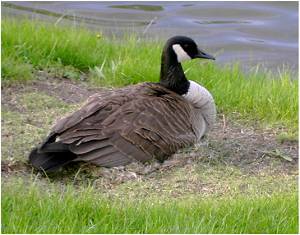 I've mentioned before how Husband Mike and I love Canada Geese, and so naturally, we get extra-excited 'round this time of year, what with all the nesting and goslings going on. We keep an eye on the nesting pairs, paying attention to who's who and where they're hanging out, as well as listening to their calls and honks through our open windows. Because one couple, Boaz and Ruth (don't know why exactly we named 'em that; Husband Mike just started calling the female Ruth, from the Old Testament's Book of Ruth, so of course the male then had to be Boaz), built their nest within sight of our building, we wound up watching them even more than the others. So, when we heard an enormously loud and sustained racket coming from their area late last Thursday night, we were initially puzzled. What on earth could they possibly be complaining about at 12 a.m.? After 20 minutes went by and the honking showed no signs of stopping, Husband Mike decided to investigate. It seemed like forever before he returned, and it was with distressing news: a coyote had killed and run off with either Boaz or Ruth; he couldn't tell who due to the darkness. 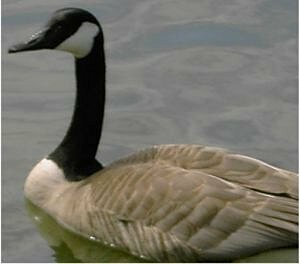 As he approached the area, a bunch of geese were paddling in the middle of the pond and honking; the source of the commotion. When he continued towards Boaz and Ruth's nest, he saw a large, dark shape move -- the coyote, who then ran away, dragging the body. While Husband Mike described the scene around their nest -- feathers and down scattered in a large area just a foot or two from it -- we heard a repeated, plaintive "honk" drift through the open window. The next morning, we were able to confirm that it was Boaz who died, and from the look of things, he did so while protecting Ruth and the nest. Three eggs were destroyed in the attack (two were cracked and one wound up in the water), but thanks to Boaz's sacrifice, three eggs remained and Ruth survived. With such a dramatic example practically dropped on our doorstep, I found myself pondering the nature of sacrifice. If a mere goose could lay down his life for his mate, what about me? Would I be able to lay down my life for my husband if the situation demanded it? Would I have the strength to suffer so that others could live? I was reminded yet again of how astonishing it is that Christ did just that for us, His Church, His Bride. Not knowing when the remaining eggs would hatch, or if the coyote would return, we anxiously watched and waited over this weekend, hoping Boaz's sacrifice wouldn't be in vain. Fittingly, they hatched today, on Mother's Day. All you birds of the air - praise the Lord. Goose and gander - praise the Lord. This is such a fantastic reflection. I hope you can carry it in your publication. At the very least, it belongs in the Catholic Carnival! 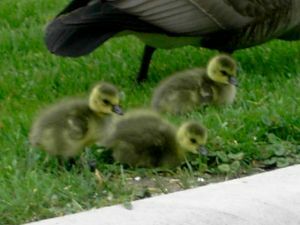 BTW, the goslings and Ruth are doing fine -- the lil' puffballs are getting bigger by the day and are such a joy to watch.